To create the hottest imaging. CHR FX volume II is a package of even more ultra contemporary effects, impacts, punctuators and beds that will transform your station imaging. Edgy and fast, cool and experimental, it's a package of 120 fully produced and highly usable cuts. Together with CHR FX volume I, this package provided the core imaging for The Galaxy Network and The One Network. Now for the first time it's available to image your station at an incredible price. 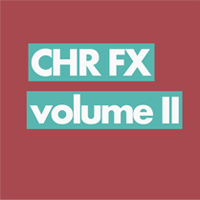 CHR FX volume II is available to purchase and as a buyout and download in full quality WAV. Get in touch with us with your details we'll get straight back to you with a price tailored to your station and usage.